An abrasion (or a graze) is a superficial injury involving only the outer layers of the skin and not penetrating the full thickness of the epidermis. Abrasions exude serum, which progressively hardens to form a scab, but they may also bleed because occasionally they are deep enough to breach the vascular papillae that corrugate the undersurface of the epidermis in which case frank bleeding may be present at an early stage. More superficial abrasions that barely damage the skin with little or no exudation of serum (and thus little or no scab formation) may be termed brush or scuff abrasions. Scratches are linear abrasions typically caused by fingernails across the surface of the skin. Pointed but noncutting objects may also cause linear abrasions and to differentiate them from fingernail scratches may be termed "point abrasions." 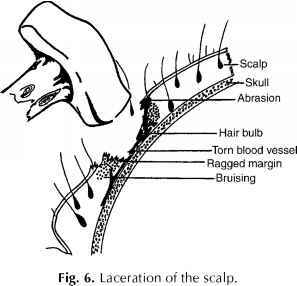 Abrasions often result from movement of the skin surface over a rough surface or vice versa (see Fig. 5). Thus they may have a linear appearance, and close examination may show ruffling of the superficial epidermis to one end, indicating the direction of travel of the opposing surface. Thus, a tangential blow could be horizontal or vertical, or it may be possible to infer that the victim had been dragged over a rough surface. The patterning of abrasions is clearer than that of bruises because abrasions frequently take a fairly detailed impression of the shape of the object causing them and, once inflicted, do not extend or gravitate; therefore, they indicate precisely the area of application of force. In manual strangulation, small, crescent-shaped abrasions caused by the fingernails of the victim or assailant may be the only signs visible on the neck. 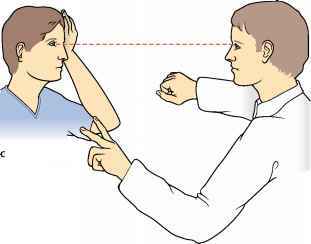 A victim resisting a sexual or other attack may claw at her assailant and leave linear parallel abrasions on the assailant's face. Some abrasions may be contaminated with foreign material, such as dirt or glass, which may have important medicolegal significance. Such material should be carefully preserved for subsequent forensic analysis. In such cases, consultation with a forensic scientist can ensure the best means of evidence collection and preservation.